Again following on from the success of the two previous races the 1838 race was also well supported by spectators of the day. As always there is some confusion about this early race as the name of the winning horse was reported as Sir Henry, but there seems to have been no Sir Henry running at the meeting and the correct winner was a horse called Sir William. Also add to this the confusion of the rider on the winner was reported as Oliver, however this seems unlikely and the correct rider was almost certainly his owner Mr. McDonough. This seems to be supported by the reports describing the horse as "A handsome savage that nobody could do anything with except his owner", but more on this later. The excitement of the race was high because one of the greatest horsemen of the day was again riding in the race, Captain Becher was to ride The Duke the horse that he was successful on in the 1836 race. The Duke was going well and was out in front when a leg started to give him trouble and soon he was being caught be the rest of the field. Sir William and Scamp where the two horses with the best chances of catching the failing leader. It was in the last half mile of the race that the writing was on the wall for The Duke as he was breaking down and was passed by Sir William and Scamp. These horses were close and it was not until the last hurdle jump that Sir William finally got the better of Scamp and went on to win the race. 3rd - The Duke - Aged - 12st 7lbs - Ridden by Captain Becher owned by Mr. Sirdefield. The story of Sir William and Mr. McDonough does not quite end there. It seems that Mr. McDonough was a really fine rider of the day who had come over from his native Ireland and was having much success here. Some were jealous of his success and in one race soon after this, he was riding Sir William in a race when someone named as "Ball" rode on to the tack during a race and deliberately knocked over Sir William. This "Ball" was dealt with by another rider at the course called Captain Lamb who apparently caught up with Ball and gave him a well deserved "father and mother of a thrashing". Mr. McDonough however was badly injured and had a broken color bone and also several broken ribs. He was forced to sell the horse to John Elmore for £350 because he had gambling debts. Mr. Elmore then sold him on for £1000 to Lord Cranstoun. Sir William when in Lord Cranstoun's charge was set to a match race with a horse called Jerry. However it would seem that nobody could get the Sir William to race and Lord Cranstoun sent for McDonough to ride the horse in this match race. McDonough put aside his convalescing for this race and duly won the race, when Jerry refused at the first. 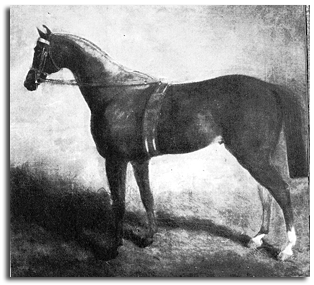 His appears to be in 1839, the following year Jerry went on to win the National.